It’s BI. And it’s Henry Blodget. But I tend to agree: Where Are The Android Users? Henry Blodget has a post up over at BusinessInsider that considers a question I’ve also asked before, and which I have been following for some time now. In a nutshell, with device sales reportedly so heavily favoring Android, why does so little mobile traffic seem to come from Android users? Blodget reports that when it comes to actual web traffic, 60% comes from iOS devices compared to 20% for Android. Talkingpointsmemo says their numbers are even more skewed toward Apple: 77% iOS devices to 21% Android. The numbers I reported earlier this year were a bit more balanced, at 56% iOS to 38% Android, with the iPhone dominating at 42% of all of mobile web traffic. No single Android device comes close to that number, by any measure. The Android slice is spread across hundreds of devices. Is it the demographics of the users that buy the devices or does it speak more to the user-interface and usability of Android vs. iOS? 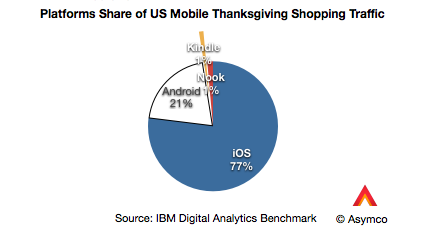 Either way, it’s an important data point for app developers and companies. In many cases, there aren’t resources available to produce two versions of an app. Based on these pathetic Android numbers, if a company has to pick only one platform, it will most likely be iOS. This, in turn, drives a virtuous circle, feeding the iOS ecosystem and creating further stickiness for Apple products. This is a big factor in considering alternative platforms and avoiding the “parents who always buy the wrong thing” problem. Nobody wants to find themselves stuck in the land of A-Z orphans – Android to Zune.